With the new Release of TeamMentor, I needed to upgrade the main GitHub repositories to the new version. This is the detailed version of the Git and GitHub workflow used. My objective was to create a set-up where I could push the new code base (3.2) while keeping a clean separation with the previous one(s). My solution was to use branches to hold each version (yes I could have used tags, but I prefer the isolation provided by branches). 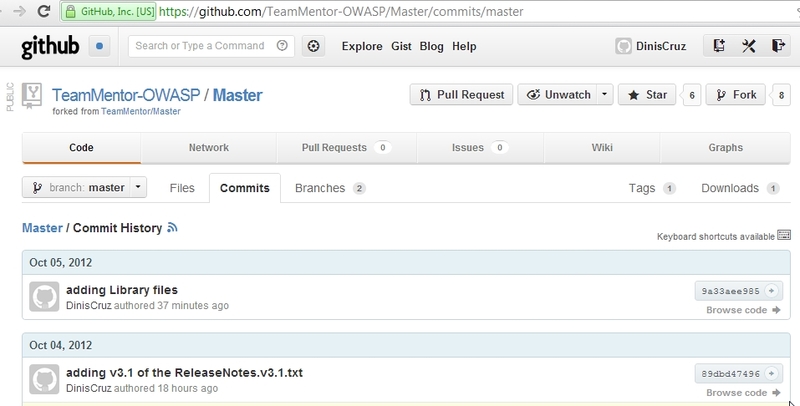 What is really cool with this set-up (and the power of Git), is that it is very easy to change to an earlier version. 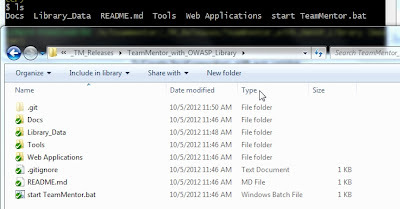 What this will do is to replace the current files in the target dir with the files from the TeamMentor_3_1 branch (which are the files from the repository we are upgrading). I can't overstate how powerful this is, specially due to the speed that it happens. What we are looking at here is a virtual file-system based on a Git database. 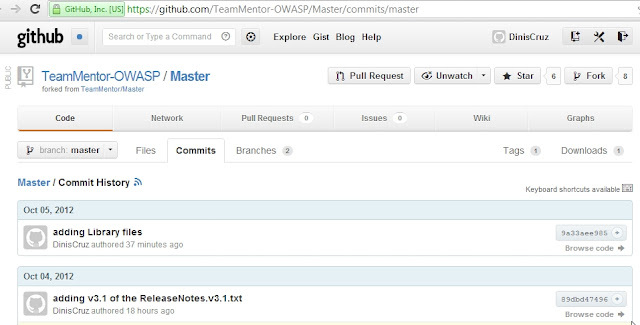 It was this feature that really made me have a massive paradigm shift, and realize that Git gives us a Version Control File-System (maybe one day we will have an OS-Level git based file-system). And we're back to version 3.2 (note the version number on the top right, under the 'Sign Up' link). I have to say that I never get tired of seeing this 'virtual file system created by branches' in action. 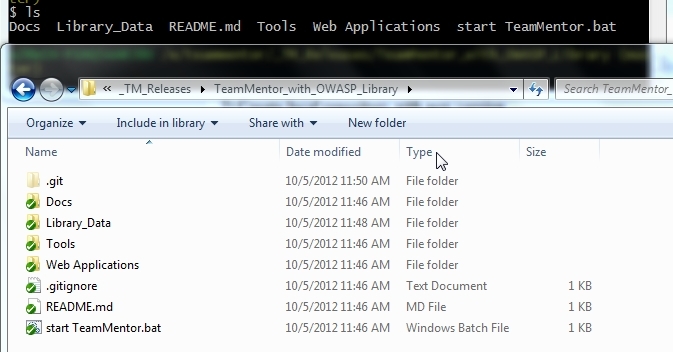 Try the checkouts a couple times with a windows explorer window open (so that you see the files change in real time). 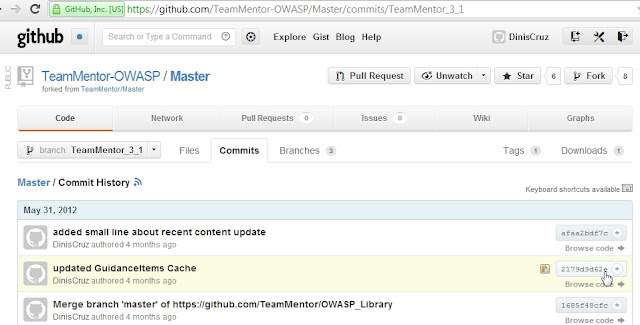 A key part of the structure created is the ability to have a merge of two Git repositories (one with the Code and one with the Data) while keeping track of their commit history (and allowing pulls of new content/data). This is achieved using the Git subtree merge strategy, which can be seen in action if you run the $ gitk command (note: I did a $ git stash first to remove a couple temporary files created by the TeamMentor engine). I did try submodules first, but they didn't work for the scenario we wanted (namely the need to have the Code+Content downloadable has a zip file from GitHub. 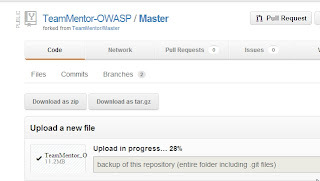 The solution was to use Git SubTrees (see this post for more details on the approach taken: http://teammentordevelopment.wordpress.com/2012/08/31/creating-a-codecontent-version-of-teammentor/ ).